These are often called Humpbacked Nymphs. 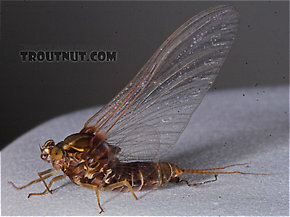 These mayflies are a sleeper hatch which has barely received a nod in the fly fishing literature. Their abundance never matches that of the classic superhatches, but they can be important on some waters. 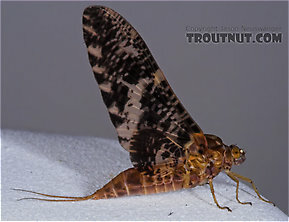 The taxonomic common name for this family and genus is Armored Mayfly but angler reports often refer to them as Humpback Nymphs and the adults as Speckled Duns or Batflies. Their primary claim to fame is their peculiar shape, both as nymphs and as adults. On most rivers they are a rare oddity, but there are places where their spinner falls elicit greedy rises and staunch selectivity from the trout. These spinners never even come close to blanketing the water, but trout have such an affinity for them that even their sparsest falls should excite the angler. I favor two explanations for their importance. First, they have a very stout profile, and late-season beetle action suggests that trout like this trait. Second, the Baetisca action lasts for up to a month on a single stretch of water. This caters to the selective trout's love of the familiar.